This was a novel I knew I would love even before I read it. Not because of the hype, but because the people who suggested it to me never steer me wrong. As I was reading this lovely book, it struck me that A Gentleman in Moscow is the type of book most writing instructors caution you against writing. It’s dense, it’s verbose, it has a lot of characters (and those characters have lots of names in true Russian fashion! ), it makes numerous allusions to things the reader has probably never read/watched/heard, but doesn’t explain them, and it’s ambitious in scope yet the author forcibly put limitations in place on the setting. Yet it works and it is masterfully done. Bravo! My love for 19th century Russian authors has not been accounted for on Isle of Books. I think I read all of those novels in high school and the early part of college before I started my blog. I am a particular fan of Dostoyevsky, having read The Idiot, Crime and Punishment, and The Brothers Karamazov. Crime and Punishment is a novel I think about rereading often. I still have yet to do it and my copy has gone who knows where so if someone wants to gift me a copy, I’d be much obliged! I also would like to reread The Idiot at some point. I’ve read Tolstoy’s War and Peace (though I joke that I only read the Peace parts) and Anna Karenina which I absolutely loved and need to reread. I’ve also read Chekhov’s major plays and short stories. 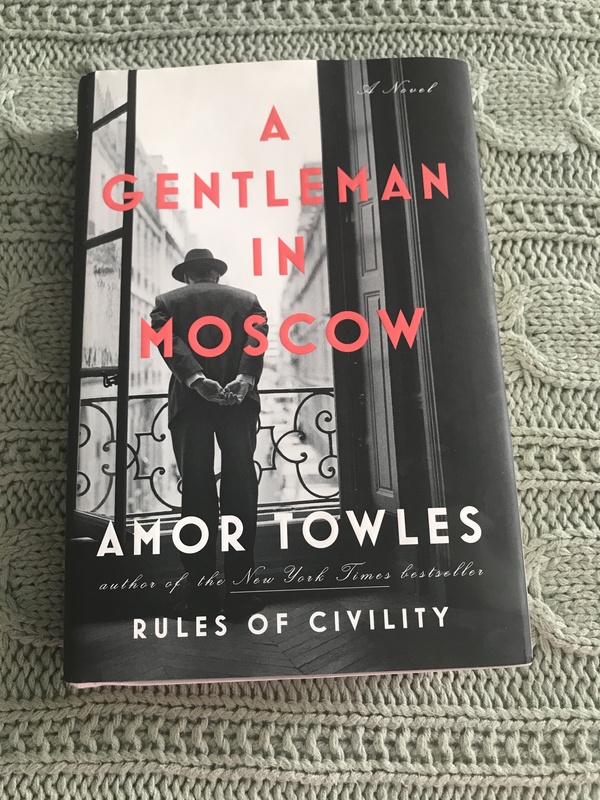 All that is to say that A Gentleman in Moscow in many ways felt like diving back into one of my beloved 19th century Russian novels. The atmosphere was so spot on, it’s hard to believe that Towles is neither Russian nor did he live through the 19th century. I enjoyed this novel’s frequent meditation on the collision of the past and present and the inexorable march towards progress and the future. Even though this story is set half a century ago and in another country, these issues still resonate in our country today as we struggle to move toward clean energy and leave behind those industries that don’t support that future. As we struggle to support larger population clusters around our major cities while maintaining our open space areas and the charm and lifestyle that current residents enjoy. I don’t think there are many novels that deal with Russian in the decades after WW-II. I’m somewhat familiar with the history of this time so it was nice to see the novel do a great job of balancing the facts with fiction to educate. Some reviewers felt this book maybe trivialized this period in a history, but I saw it as offering a different perspective, more of the perspective of the average to upper class person in the cities. The rural communities disproportionately suffered the most during the years of Stalin and Khrushchev, but that is not where the novel takes place and it does not claim to tell their story. Lastly, I was stunned to learn The Metropol Hotel was and is a real hotel in Russia. My friend sent me the link to their website where you can see photographs of the inside and recognize many of the spaces The Count and his friends occupy. Another reason I take my hat off to Amor Towles…he not only set a novel of this scope inside one tiny setting, he chose a real hotel whose history and layout he had to abide by! Not easily done!